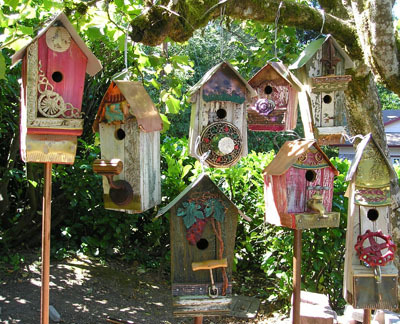 Our functional, artistic birdhouses are built to Audubon specifications with cleanouts and ventilation. We use salvaged metal for the roofs which makes the houses durable and we've had thousands of baby birds hatched successfully in our houses. 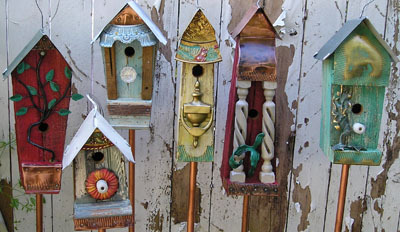 Each house has an 1¼" entry hole designed for your cavity nesting birds such as nuthatches, chickadees, and violet-green swallows. Our houses typically are constructed with 100yr old siding, painted to enhance the old wood, with perches, porches and bases from copper, brass and any number of historic decorative found objects. We sell the houses only at shows for $65 and up depending on the found objects used. Our affordable houses are a lesson in sustainability. We use objects that have ceased to serve their original purpose, but offer unique visual & textural qualities when used out of their original context in a second, more provocative life. Our goal is to provoke, in a way to arouse, a variety of different positive emotions from people often attributable to their past experiences or memories. Each house features beautiful and functional objects from society’s discards. The houses pictured here, represent our past creations. 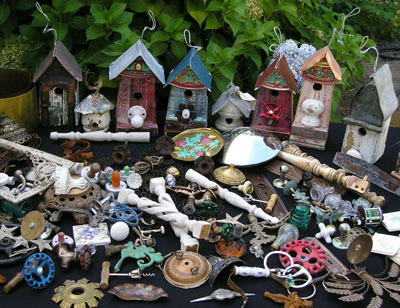 Our abundance of found objects, which is constantly changing, inspires the design of our future houses. When you come to one of our shows, you'll see our latest creations. We hope they make you smile!